On Wednesday 24 April the Science Museum will be celebrating 150 years of the periodic table with a special Lates inspired by the UN’s International Year of the Periodic Table of Chemical Elements. Join author Harriet Vyner in what promises to a fascinating talk on the life and times of Robert Fraser, or ‘Groovy Bob’ to his friends. On the last Thursday of every month we are open from 5.00pm - 8.30pm allowing the opportunity to visit the galleries for free of charge. Alison Weir will present the latest instalment of her Six Tudor Queens series, ‘Anna of Kleve: Queen of Secrets’. Join us for the Nunnery Café’s inaugural vegetarian supper club. Photographer Horst A.Friedrichs takes you on a journey of contemporary mod subculture through his stunning photographic portraits. Join us for an evening of all things forties at the RAF Museum… with a Gin and Tonic in hand! Join Natalie Gibson MBE in conversation with guest curator Teresa Collenette and gain and insight into the work of this seminal print designer. Keith Lodwick, Curator - Theatre & Performance at the Victoria & Albert Museum discusses Hollywood Costume. Barber Lates bring you face-to-face with emerging local artists, innovative performances and thought-provoking research. Enjoy the space, the atmosphere and have fun! Join us for an exclusive guided tour of the castle after hours and a 2-course meal. A super special event to welcome the arrival of the Scotforth Hoard to the City Museum. 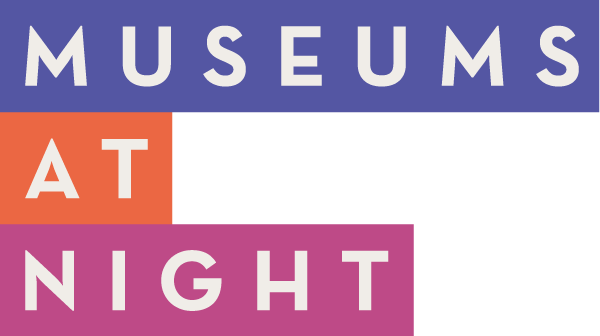 Come and enjoy an after-hours evening at the Museum, with a variety of activities taking place throughout the night for you to join in with. Explore the Museum out of hours and discover the creatures that come out at night. From musical crickets to nocturnal makes, get creative and experience the natural world after dark. WAR AND PEACE - an evening of songs and stories of love, loyalty and loss from the First World War. In this museums at night talk, Sara Pennell will explore how Huguenot communities found their culinary feet in their new communities in the seventeenth and eighteenth centuries. A short talk about the local lead mining history followed by time with the guide in to look around the Museum. After-hours pub quiz with historic boozer the Jerusalem Tavern, former resident of St John's Gate. Rosie Garland, our writer in residence, reveals how our unique collections and hidden spaces inspire her writing. ‘Why have there been no great women artists?’ Join us for an insightful evening where we will challenge Linda Nochlin’s controversial question by shining the light on the women behind the art. A unique opportunity to tour the House at night and hear the tales of incidents we cannot explain. Visit areas where our resident presences have been detected. Experience ARTIST ROOMS: Alex Katz after hours with a tribute to 1960s New York. Enjoy music, cocktails, hands on activities and new ways to appreciate art. FREE after hours family fun at the recently renovated Chapel - Hold a real owl, make and take crafts including origami bats and glowing fireflies; tour of the grounds 5.30pm. Join Alistair O’Neill from Central Saint Martins to learn about the pivotal role played by Carnaby Street and King’s Road in defining 1960s Swinging London. Come along after hours to get a closer look at our collection. Free admission to locals after 5.30pm! An evening classical concert in the beautiful surroundings of Kettle's Yard. Doors open at 7:30 and the performance begins at 8pm.